The main event. 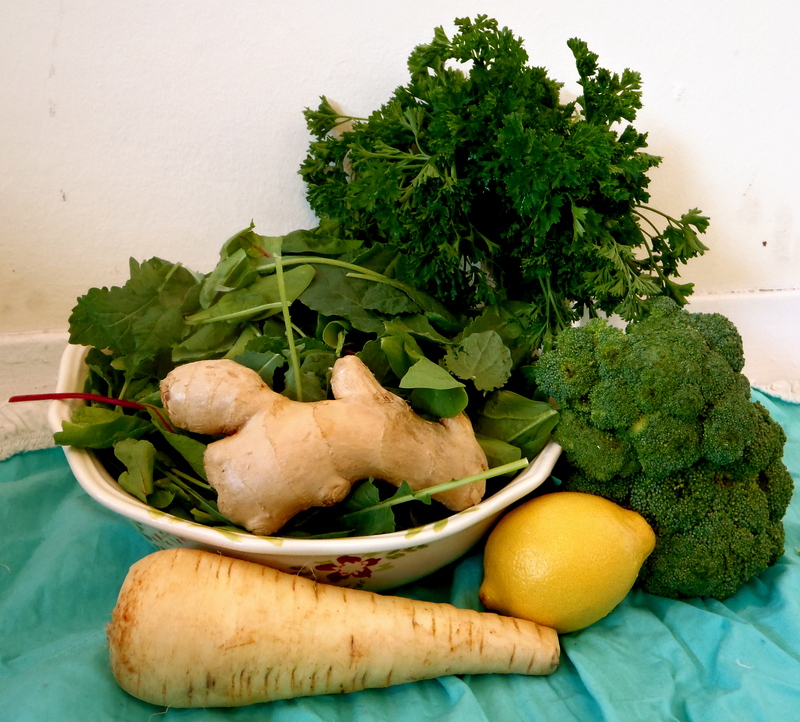 Our list of detoxifiers: spinach, broccoli, parsley, ginger, lemon, and parsnip. To decrease fibrosity (that’s a word right?) of the final product try cutting the parsnip in half and removing the centre. Hi friends! I hope you all had an amazing weekend. Mine was spectacular! I took some time off from school (since I had a four day weekend, yay!) and responsibility, read some books for fun (Food Synergy by Elaine Magee and The Amber Spyglass by Philip Pullman are in my queue right meow), bought some herbs for tea, explored a new coffee shop and the Toronto Reference Library, and did some window-shopping. Sidenote, Anthropologie has the most adorable dish sets, oven mitts, and aprons… hint hint for anyone looking for a Christmas present pour moi. I also got back into my routine of going for afternoon constitutionals in the park by my house. It’s been unseasonably warm the last few days so it’s perfect for strolling and daydreaming. I spent the rest of the weekend working on a case study, this time for H. pylori, the bacteria at the root of many cases of gastric ulcers, while playing all the LOTRs in the background. 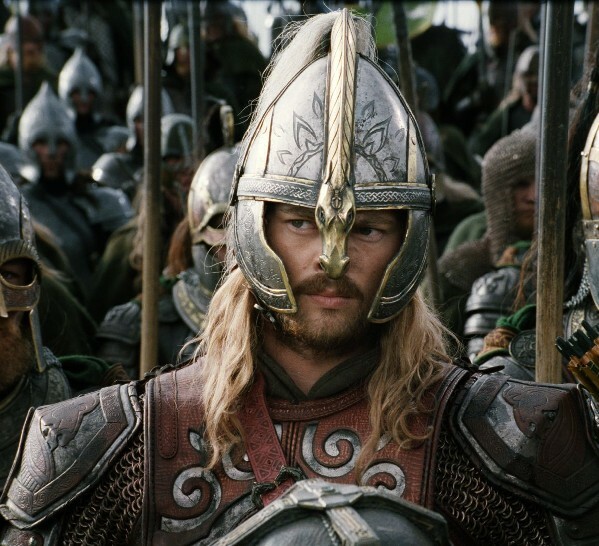 Somehow assignments don’t seem quite so bad when Éomer is onscreen rocking the best helmet ever. Best helmet ever, or what? Anyhoo, last night I had one of the best meals I’ve had in a very long time. My cousin Ben and I decided we wanted to go somewhere new so we wandered about for an hour until hitting up Augusta in the Kengsington Market. Finally we found this adorable little yellow restaurant called Le Kensington Bistro and Rotisserie. Now we had been discussing how we don’t like going out and eating things we could easily make at home, so when we saw this menu we got super excited. 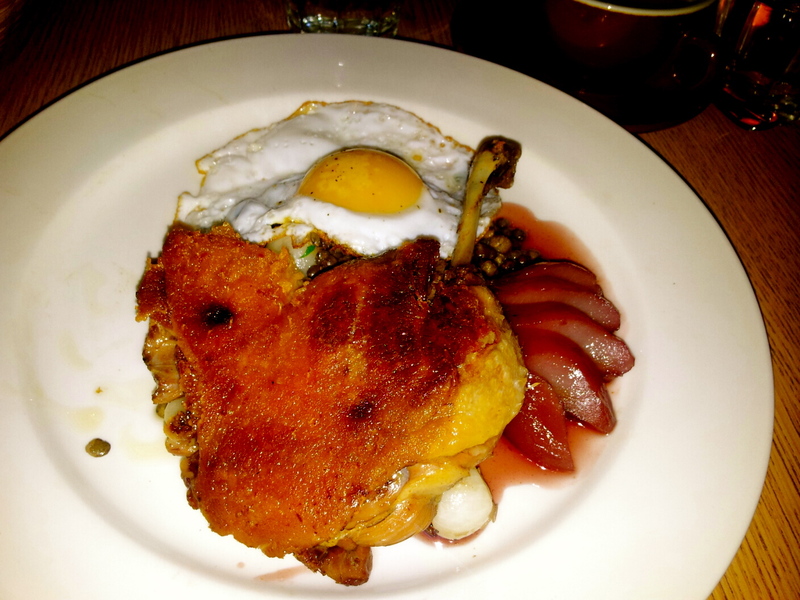 There were sweetbreads, beef tartar, seared skate, steak frites, butternut squash risotta and the piece de resistance: Duck Confit with sunny-side up duck egg, bacon Du Puy lentils, pearl onions, and port poached pears. After our hour-long journey trying to find dinner, this meal was worth every side-route it took to get there. Every bite was sheer perfection. So good. At first I thought the skin was breaded and I was ready to cry cause I would have had to pick it off. But no, the skin was just that crispy and the fat just that excellently rendered! I really liked this dinner if you couldn’t tell. The duck skin was perfectly crisped, the pear and pearl onions added an amazing sweetness that went perfectly with the richness of the duck and egg. Can you tell I freaked out about how good this dinner was? It wasn’t super expensive either, and the atmosphere was wonderful. It was painted a cheerful yellow on the outside and indoors was candlelit and cozy with a view back into the kitchen. The menu was posted on a chalkboard on the wall and in addition to their delicious appetizers and mains, they also do house-made charcuterie and rotisserie chickens. Ben and I decided to go back next week for brunch. My only regret is that I discovered this restaurant so close to my departure from the city, otherwise I’d likely be there at least once a week. So maybe it’s actually a blessing in disguise. I highly suggest you all get off your computers and go there right meow and try everything. Word on the street is their crème brulee (honey lavender) is out of this world. I don’t typically partake of dairy or refined sugars, but life is all about balance, so I think I may have to give it a try at least once before I leave. If any of you head out there and get it, let me know what you think! I suppose I should get to the soup meow, huh? Today’s soup is perfect for building strength and immunity as we get deeper into the cold winter months. 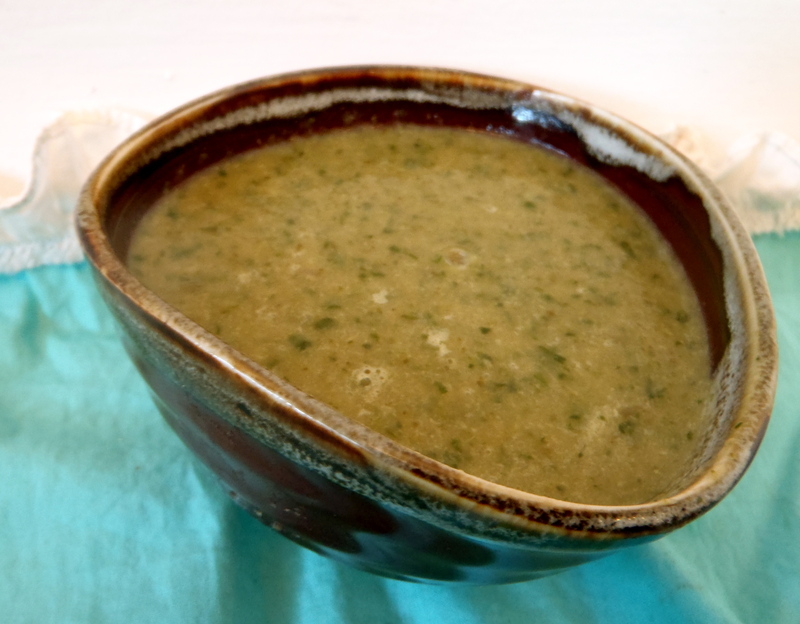 It’s my Delightfully Delicious Detoxifying Green Soup! Let’s get to it shall we? 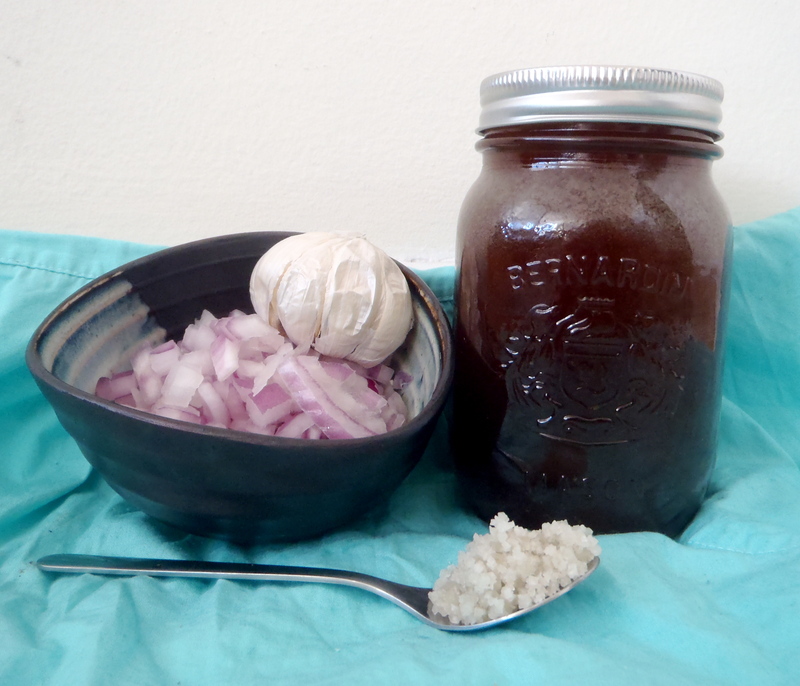 Our basics: broth, sea salt, garlic, and onions. Try replacing or augmenting the spinach with dandelion greens. These bad boys help promote detoxification via their diuretic action. However, unlike most diuretics, dandelion contains potassium so you won’t throw off your sodium-potassium balance. Place a large saucepan on the stove on low heat. Add garlic and onions and simmer, covered, while chopping the rest of your veggies. Add broccoli, parsley stems, ginger, and Jerusalem artichokes. Cover pot and simmer until veggies are fork tender (they break apart when you push on them with a fork). Add parsley and spinach cover for about 1 minute. Add another 2-4 cups of water depending on desired consistency. Puree using a handheld blender. You don’t have to completely puree the soup; it’s nice with a few bits of whole broccoli left in it. Taste and add more salt and another squeeze of lemon if desired. This bad boy is part of the brassica or cruciferous family, along with kale, Brussels sprouts, and cauliflower, so if you’ve been reading along for a while, I think you may know why I included broccoli in my detox soup. Any guesses? Why that’s right! It does have sulfur-containing compounds, such as sulforaphane and isothicyanates, that help increase our liver’s production of the enzymes necessary to break down toxic substances, thus leading to increased detoxification capacity. It’s also a great source of antioxidants, such as carotenoids, vitamins C & A, to help keep us all looking young and fresh. Go broccoli! This herb is a great source of phytonutrients (such as beta-carotene) and vitamin C, which help protect the body from oxidative stress and damage and help boost the immune system. Parsley also acts as a great chelator of heavy metals and other toxins, which it then helps remove from the body via urine as a diuretic. Since it helps detoxify the system, it decreases one’s overall toxic load and makes it less likely that when cold and flu season comes around, we’ll be the ones getting sick. The final product. It will be more of less green depending on whether you use water or a super dark homemade broth. These tart citrus fruits are famous for their vitamin C content (sidenote: red peppers are one of the highest food sources of vitamin C). Lemons also contain phytonutrients, which together with the vitamin C have an antioxidant effect in the body. I like having a squeeze of lemon in my water as it can help promote better digestion thanks to the citric acid and because it stimulates the stomach to secrete more digestive juices, which helps keep things moving along during the day. As a natural antiseptic, upon consumption lemon juice can help control harmful bacteria and thus help decrease burden on your liver. Protip: If your budget allows you to buy organic lemons you can cut them up into cubes and dry them then add them to your teas to add a nice zip of flavour. I don’t recommend doing this with conventional lemons as the pesticide residues will leach into your tea and we don’t want to consume any excess and unnecessary toxins. Not only is garlic incredibly delicious, but it also contains a specific sulfur component called allicin, which “promotes antioxidant activity and functions as a powerful antibacterial and antiviral agent that joins forces with vitamin C to help kill harmful microbes.” (George Mateljan, 258) Doesn’t he make garlic sound like some sort of stinky superhero? Sometimes nutrition textbooks aren’t as boring as one might think. Anyhoo, the compounds in garlic can help boost the immune systems and decrease one’s toxic load, by finding and eliminating pathogens and helping to repair any oxidative damage caused by toxins and foreign food particles. This delicious bulb has long been known to have properties, which help alleviate digestive distress and calm upset tummies. Does anyone remember drinking totally flat ginger ale when they were sick as kids? It works by helping to relax the digestive tract and stimulating digestive juices. These functions help improve overall digestion and can help kill any ingested bacteria before they pass into the body, thereby decreasing the detoxification load of the liver. This spicy herb also contains super potent anti-inflammatory compounds called gingerols (which sound like overalls for ginger bulbs. How cute would that be? ), so ginger is great for alleviating inflammation-related pain, like arthritis. These little roots are probably one of my favourite veggies. They make delicious chips or fries, silky purees, and are an excellent source of prebiotic fibre. This type of fibre is food for the good bacteria (probiotics) in our digestive systems. Keeping them happy and well-fed ensures your tummy will be happy, you digestion will run smooth, and your immunity will stay high! Well that’s all for today friends! I hope you’ve had a wonderfully whimsical weekend and that you all enjoy a fruitfully fantastic week. Personally, I have three-day school weeks for the next two weeks in a row and I can’t wait! I’m doing a couple mini business seminars next weekend and will be working on my very last case study ever at IHN. It’s a bittersweet moment. Actually, it’s not. As much as I love case studies, I don’t love having to follow someone else’s guideline for writing them. Alright, enough. Until next time, happy eating!